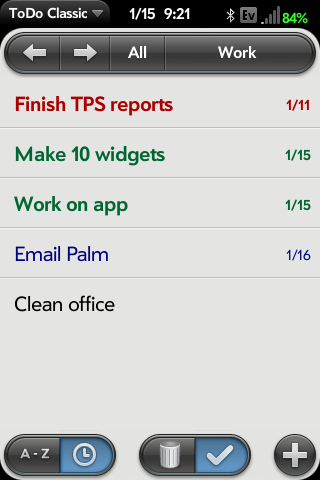 This app was inspired by the ToDo app in Palm OS. Since leaving Palm OS for Windows Mobile a few years ago, I've been unable to find a ToDo app that I liked as much as the one in Palm OS. I finally decided to take matters into my own hands and create a webOS version that incorporates much of the same functionality while adding a few tweaks. This is an early release and still has some bugs. Please let me know if you run into any problems, and I will try to sort them out as soon as I can. Thanks for helping me make this app better! I hope you like it.